Artificial tears are lubricating eye drops and gels that are used to add moisture to the eye. These are also called ocular lubricants and are basically formulated to relieve burning, irritation and discomfort caused by dry eyes. Dry eyes can be caused by prolonged use of computers, dry and smoky weather, tiredness, and some other factors. Artificial Tears are segmented into different types such as cellulose-derived tears, glycerin-derived tears, polyethylene glycol and propylene glycol based tears, oil-based emulsion tears, and others. The increasing incidences of dry eyes syndrome are boosting the demand for artificial tears across the globe. In this report, the Artificial Tears market is segmented by type, by end user age groups, and by geography. The Artificial Tears Market generated revenue of $2142.1m in 2017 and estimated to exceed $2639.6m by 2023, growing at an estimated CAGR of 3.6%. The global market for artificial tears has been witnessing a brisk growth in the recent years owing to increasing incidences of dry eye syndrome and other eye-related problems. There is a dramatic rise in dry eye complaints among people in their teens and 20s in the past five years due to prolonged exposure to blue light emitted from digital screens, increased use of mobile phones, increased pollution levels, and dry weather spells. The 60 years end-user age group accounted for 45% of the total market share in 2017, followed by the 40–60 years age group with 35%. 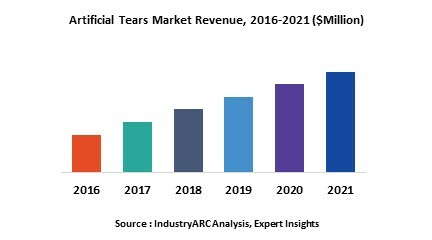 The artificial tears market with respect to the 40–60 years age group was valued at $753.0m in 2017 and is estimated to reach $952.9m by 2023, growing at a CAGR of 4.06% during the forecast period. It is estimated that nearly five million Americans above the age of 50 years are afflicted with dry eyes, which is more common in women than men. One of the major drivers of the artificial tears market is the growing prevalence of dry eye syndrome (DES) owing to several factors such as prolonged exposure to digital displays, rising pollution levels, protein and vitamin deficiencies, and climatic changes. The growing geriatric population and rising number of eye surgeries that demands the use of artificial tears for post-surgery management are also boosting the market growth. Development of several preservative-free artificial tear brands such as Systane Ultra (Alcon), Blink Tears Preservative Free Drops (Johnson & Johnson Vision Care, Inc.) and REFRESH OPTIVE Preservative-Free (Allergan, Inc.), and their benefits on ocular health have also increased the adoption of lubricant eye drops. The Asia-Pacific artificial tears market is forecast to grow at the highest CAGR OF 5.68% during the forecast period 2018–2023. The use of artificial tears is associated with several side effects such as blurred vision, long-term irritation, and so on, which is a major challenge for the artificial tears market. There are some preservatives that are present in artificial tears, which has several adverse effects on eye health. The development of various medications that are capable of reducing irritation caused by dry eye syndrome is also limiting the growth of the artificial tears market. The base year of the study is 2017, with forecast done up to 2023. The study presents a thorough analysis of the competitive landscape, taking into account the market shares of the leading companies. It also provides information on unit shipments. These provide the key market participants with the necessary business intelligence and help them understand the future of the Artificial Tears Market. The assessment includes the forecast, an overview of the competitive structure, the market shares of the competitors, as well as the market trends, market demands, market drivers, market challenges, and product analysis. The market drivers and restraints have been assessed to fathom their impact over the forecast period. This report further identifies the key opportunities for growth while also detailing the key challenges and possible threats. The key areas of focus include the types of artificial tears, end their uses by different age groups. Some of the key players mentioned in this market research report include Bausch + Lomb (the U.S.), Johnson & Johnson (the U.S.) Novartis International AG (Switzerland), AFT Pharmaceuticals (New Zealand), Allergan plc (Republic of Ireland), Akorn Inc. (the U.S.), Santen Pharmaceutical Co., Ltd. (Japan), Rohto Pharmaceutical Co., Ltd. (Japan), VISUfarma (Netherlands), Otsuka Pharmaceutical Co., Ltd. (Japan), NovaMedica LLC (Russia), ENTOD Research Cell UK Ltd (the U.K.), OASIS Medical, Inc. (the U.S.), and Abbott Medical Optics Inc. (the U.S.). Rising incidences of Dry Eye Syndrome (DES) across the globe due to prolonged exposure to digital displays, rising pollution levels, protein and vitamin deficiencies, and climatic changes are driving the market for artificial tears. According to the National Health and Wellness Survey, approximately 5% to 30% of the people above 50 years in the U.S. are afflicted with dry eyes syndrome. 14.3. Dole Food Company, Inc.
14.4. Lamb Weston Holdings, Inc.
14.6. Yantai China Pet Foods Co., Ltd.
14.8. Wayne E. Bailey Produce Company, Inc.
14.9. A.V. Thomas Produce, Inc.